International Assembly of God A Church for Every Language Group ! Pastor Johnson George was born to a pioneering missionary-pastor family of Kaniyamparayil George and Sosamma in one of the Southern states of India, Kerala. He is the ninth and last child to his parents, brought mostly in North Kerala as his parents were moving from place to place to pioneer in unreached villages with the Gospel. Two of his brothers are in pastoral ministry and two sisters served in Operation Mobilization. In both his paternal and maternal family there was a zeal for mission work and mostly every member served the Lord at several capacities and led godly lives. Johnson George accepted the Lord at the age of 8 in a Sunday school class, but a deeper experience of confessing sins and accepting Jesus happened at the age of 18 which he calls his discipleship commitment’. He got baptized soon after this and had the experience of the in-filling of the Holy Spirit in another two years with various gifting. After completing his Bachelor of Science degree from Calicut University, India, he joined theological studies in Faith Theological Seminary for a 4 years degree program, and served the Lord along with studies mostly by organizing gospel teams to reach out to villages for Christ. On completion he decided to move to North India and served the Lord as a pioneering missionary near New Delhi for an year. Soon he felt his calling of teaching God’s word and to equip himself for this he joined Serampore College, Calcutta, India and completed his Bachelor of Divinity program with a focus on biblical languages, Hebrew and Greek. While in West Bengal he started the Rishra Fellowship. The next year he taught in Gospel For Asia Biblical Seminary, Tiruvalla, India, but the felt the need to continue in New Testament studies and joined back Serampore College for Master of Theology with a focus on New Testament exposition, along with serving the Lord as an associate pastor in India Pentecostal Church, Calcutta. Joined back GFA seminary (now Believers Church Theological Seminary) as a lecturer in New Testament and Greek. Along with his students, he started three churches during this period in Alleppey, Pala and Kunnumpuram, Changanachery. In 2002 October got married to Binu, who left her Catholic tradition to follow Christ alone from her family. In 2004, he was appointed by his church to give leadership to church planting initiatives in Kerala state which was followed by his appointment as the Overseer of Kerala State with 400 churches and several sister institutions where he served until 2008. In 2008, Johnson felt the need to get back to mission field and at the turn of 2009 he moved to Central India leaving his church. He and his wife together founded the pioneering gospel organization named Satveda Mission with an initial focus on the Konkan region, Maharashtra of Western India later reaching out to several other states of India. They lived in a totally non-Christian tiny village and served the Lord for next three years. It was there they started an orphanage, a Bible School, a gospel publishing house, and many other programs. The monthly magazine Satveda Sandesam reached out to a wide range of readers equipping them in Christ and Johnson served as the chief editor. Soon Johnson felt the need to train and equip the village pastors of Central and North India much more widely than in his small Bible school and started a program along with some of his friends which focused reaching out to where the un-trained missionary pastors live. This necessitated Johnson and Binu to travel widely and they moved to Bhopal, Madhy Pradesh in the very center of India in 2012. The initiatives they started by now had 10 boys in the orphanage, 12 youngsters in residential Bible school, 23 full time missionaries, a gospel publication department where hundreds of thousands of gospel fliers, books, and magazine printed. All these were done without any regular support from any organization. In course of time they felt the need for more funds and Binu decided to work and support the mission. She applied for a job in United States and within a month God brought her to US in 2013 July. Johnson reached US in November, 2013. Within a couple of weeks, the elders of an Indian church, Bethel IPC of Arizona contacted Pastor Johnson and requested him to be their senior pastor which he accepted and served until September, 2017. IPC Western region elected him to the executive as the Vice President in 2016 and he continued in the position until he moved out from Phoenix, Arizona. He also served as a Correctional Chaplain with Arizona State Correctional facility during the same period. Pastor Johnson and his wife Binu lives with a passion to imitate Christ in all their walks and serve Him at any cost. A burning passion for winning souls, irrespective of any man-made barriers, for the kingdom of God is what marks their ministry. Pastor Johnson enjoys Bible exposition, counseling, evangelism, travelling, live-talks in contemporary media and conversation with people. Binu is a math-science teacher by profession and enjoys serving people with the love of Jesus. 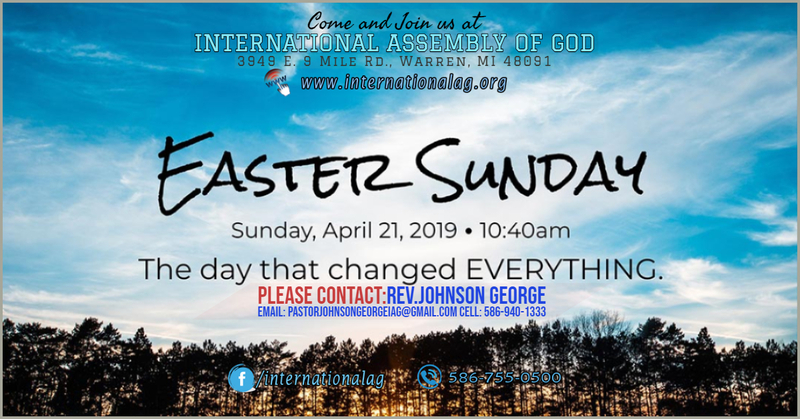 Pastor Johnson George has been appointed to International Assembly of God Church. His first Sunday was October 8, 2017. The consecration service was led by Rev. Jeff Hlavin, Assembly of God Michigan District superintendent.